When returning a lease return vehicle, the dealer or an independent company will inspect your vehicle for damage that is beyond normal “wear and tear”. The inspector may then estimate what the cost will be to repair this additional damage. They then may add this cost into your final payment or roll it into your new lease. Most inspectors and dealers will know about paintless dent repair and what the costs associated with it. Though, they are not an experienced PDR technician and may not know what can and can not be repaired with PDR. They may look at the damage that can be repaired with paintless dent repair or be repaired to an “acceptable” level of repair. They then may access charges for conventional auto body repair not knowing that the damage could be repaired with PDR. When the inspector charges for PDR they may be using a guide to estimate charges. You will then be charged full price for PDR. If you have multiple dents per panel or more than one panel with damage, we at Excel Dent Removal can offer discounts for multiple dents. 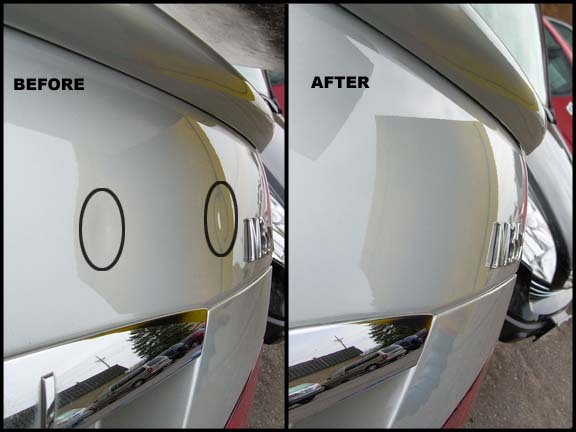 A vehicle with hail damage is also something you will want to have estimated by a paintless dent repair company. With multiple dents on the vehicle, you will want to know what the charges will be before returning your lease vehicle. This was a repair of a few dents on a 2006 Infinity M35x rear of the deck lid. This car is due to be returned to the lease company or the auto dealer where it was purchased. The cost of repair was $125.